A Page Layout is an individual document, or page, that maintains images, drawing objects, text, page settings, reports, and graphs. You can save this pre-styled page and reuse it like a template, or make it available to others. Select Save Current Page As from the File menu to save the individual page, or select this option from the Save button on the Standard toolbar. Type in a file name for the individual page. Note: If you select an existing procedure name (.fex), the Specify Name dialog box appears, asking if you want to replace the file. Click OK to close the Save Current Page As dialog. The individual page is saved as a new procedure maintaining images, drawing objects, text, page settings, reports, and graphs. Note: These files can be saved to your local desktop or anywhere in the WebFOCUS environment. However, when saving to a local project, the file is not automatically added to the project. Select the procedure file (.fex) of the page layout. The selected procedure is added to the open procedure. There may be an additional step if a Page Master exists in the current layout. A message appears stating that a Page Master already exists in the current layout. You may replace the Page Master, merge the two, or ignore the Page Master. Click Yes to replace the existing Page Master with the new one. Click No to merge the two Page Masters and combine all of the objects from both Page Masters. Click Cancel to use the existing Page Master and ignore the Page Master from the page layout. The new page layouts are appended to the end of the document. For more information about Page Masters, see Using Page Masters in Document Composer. Open or create a document. Right-click on a page layout. The context menu opens, as shown in the following image. Select either Insert existing page after or Insert existing page before. Navigate to a previously saved page layout, select it, and click Open. The previously created page layout is inserted either before or after the page layout you selected. Select either Insert new page after or Insert new page before. The new page layout is inserted either before or after the page layout you selected. 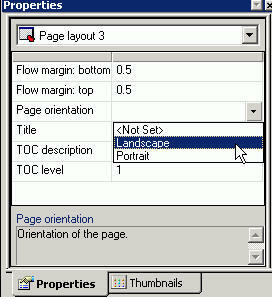 You may set portrait and landscape page orientations for different pages in one document. Page orientations set at the Page Layout level override the page orientation set at the Compound Document level. If no page orientation is set for the individual page layout, then the Compound Document page orientation property is applied to all pages in the document. Note: Page orientation settings are ignored if you are using PowerPoint as the document output format. Select a page layout from the drop-down list of objects in the Properties window. The corresponding page layout properties appear. Use the Page Orientation drop-down list to select Landscape or Portrait. Note: <Not Set> is the default selection. If no page orientation is set for the individual page layout, then the Compound Document page orientation property is applied to all pages in the document. The page orientation is shown as either Landscape or Portrait for the selected page.